Headquartered in London, Aviva has two objectives: to help people save for the future and to help people manage risk. The company offers insurance and investment products across 16 countries, and has 33 million customers and 22,000 employees. It is the largest insurer in the UK and the second largest general insurer in Canada. For Aviva, the mantra is to help people defy uncertainty. Digital First is a key component of Aviva’s strategy. This means putting digital at the forefront of all change and development activity across the company. It also entails forming partnerships with a range of new and existing players in the digital space (including start-ups), improving customer experiences, and building out digital distribution capabilities. In support of this strategy, Aviva has created Digital Garages in London, Singapore, and now Toronto which act as catalysts for digital innovation efforts. And, in December of 2015, Aviva launched Aviva Ventures with the objective of investing $100MM by 2020. Aviva Ventures is housed with London’s Digital Garage, which facilitates cross-pollination. Serge Taborin joined Aviva as Digital Innovation and New Business Director in November of 2015. 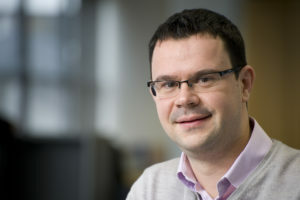 He leads the effort to identify, develop and partner on new digital concepts across Aviva’s markets and product lines. Q. Serge, before joining Aviva, you were co-Founder and CEO of an angel-backed mobile startup called Q App. What’s it been like, moving from a year-old startup with a dozen or so people to an insurance giant with roots stretching back to 1696? A. Is “What possessed me?” the question you’re looking for? Even five or six years ago, you were either a startup guy or a corporate guy. Now, the two worlds are coming much closer together. There are several reasons for it, but one of them is that startups are finding it far more difficult to come out on top on their own due to the level of competition and resources required to reach scale. Of course it happens, but the odds are firmly stacked against you. On the other side, the corporates have found it difficult to launch disruptive, transformative new ideas internally for many well-documented reasons. The intersection of the two worlds has fascinated me for a while because each side has what I would call unfair advantages, and it’s the ability to leverage those that makes this – that layer between the corporates and the startup universe – a very exciting space. I’m fascinated by the point in time at which the insurance industry has found itself. The confluence of emerging technologies, changing consumer behaviors, and the amount of capital available to startups is getting us to the stage where disruption is going to happen. In terms of why Aviva specifically, this is a 300-odd year old organization that has put its money where its mouth is in terms of trying to disrupt itself before it gets disrupted. Q. Is there an overarching vision for innovation at Aviva? A. We view innovation as consisting of three streams of activity. We think of them internally as brilliant basics, transformative innovation, and disruptive stuff. On brilliant basics, this is recognizing that as an industry – and I’m being generous, here – we are probably five years behind digital consumers’ expectation. What’s often ignored in the insurance space is that our customers have their expectations set by Google and Apple and Amazon, not by our peer organizations. So, brilliant basics is an extremely important effort to bring the insurance industry into today. Transformative innovation is taking some of the things that have been done in this industry for a long time but recognizing that there are ways to do these things better and faster with new technologies. The third bucket is the more disruptive stuff. This is opening new consumer channels, even doing things in a way that could compete with what we currently do. Typically, I focus more on the second and third buckets, particularly the third. We have specific teams focusing on brilliant basics and transformative innovation. They are parallel streams. Q. Can you tell me more about how are you organizing for digital innovation at Aviva? A. Let me answer that question in terms of execution. There’s internal development. This is addressing what Donald Rumsfeld would call the known unknowns. This is the stuff where we either have unique insights about the opportunity or it is something that is strategically important to us and we have the skills to deliver on it. The second area is externally focused. This is addressing the unknown unknowns. Areas where we don’t have the right skills or where we find it difficult to attract the right level of skills into the organization. Also, it’s about agility, speed, and the passion for one thing that startups are very good at. So, we use a combination of the two, with the second one going back to the unfair advantages that I mentioned. There are things that we have that a startup would absolutely kill for – customers, data, the balance sheet, and so on. We’re finding ways to leverage our unique advantages and the unique advantages of startups to get the proper outcome for both parties. Q. Aviva is active in 16 markets around the globe. How do you allocate your innovation resources across those markets and coordinate efforts and investments so that Aviva is getting the biggest bang for the buck? A. There are two elements. There’s the sourcing and there’s the execution. The sourcing of ideas is very much global. We have a presence in Silicon Valley, we have a strong presence in Europe, we have a presence in Israel, and we have quite a strong presence in emerging areas in Asia. Our funnel of ideas is strong and we have our finger on the pulse so we can sense emerging areas of opportunity. In execution, we are more focused. In our parlance, innovation means identifying the opportunity and then having the early proof of relevance to the market we are trying to serve. In other words, we are trying to ask early on if this is just an interesting idea, or if it’s an interesting idea that has a market. Typically, execution begins in one of larger markets initially, where we have much greater brand strength, greater market access, greater market penetration, and so on, which lets us get to the answer faster. But we do have a focus on some of the emerging markets in Asia, such as India and Indonesia, just because of their sheer potential. Q. What can you tell me about commitment to innovation at the top of Aviva, and how that commitment manifests itself? A. Great question. This if one of the reasons I joined Aviva when it wasn’t an obvious career step to take. There’s a huge amount of commitment, starting with Mark Wilson who’s our global CEO. He has an unwavering commitment to turning Aviva into a digital company. A lot of CEOs will say that, because they’re expected to, but Mark is brutal in terms of driving this change internally. Having his backing and of course the backing of the board means that a lot of the hurdles one might expect to see get blown aside much more rapidly than otherwise might be the case. The investment we’ve made in Garages, and so on, also speaks volumes about that commitment. But there’s also sometimes a bit of a challenge internally because of his expectations for speed. Mark’s biggest complaint about our digital teams and innovation teams is that we don’t call him often enough for help. He says that if people aren’t complaining about you it means that you’re not pushing the boat hard enough. Q. What are the biggest opportunities for innovation at Aviva and how are you addressing them? A. In broad terms, we split activities into two areas. Some are more transformative and some are addressing the known unknowns – the stuff that is well defined and will deliver value in the shorter term. We do think there are some obvious wins we can deliver using new technologies. About 30% or 40% of what I do is focused on that. The rest is very much aimed at increasing customer engagement and on things like prevention: exploring how we help our customers prevent bad stuff from happening. The emergence of technologies like AI enable us to work on efficiency and automation but also enable us to create a far more engaging and consistent customer experience. Connected devices and IoT also present us with a great opportunity. Connected cars – we’re a huge auto insurer – is a sweet spot as well. These are some of the things we are looking at, as well as a handful of others that I can’t talk about yet. Q. Outside of what Aviva is doing, where do you see the biggest opportunities for innovation in the insurance industry? A. This a slightly more difficult question to answer because the opportunities are very much depended on geography. My own activities span North America, Europe, and Asia. These are such different worlds in terms of adoption, customer sophistication, how the industry works, and so on. I think what we see in the North American and European markets is certainly that IoT, connected assets, and also connected people offer some really interesting opportunities. Clearly, connected cars will have a transformative effect on the auto insurance industry, and as we move to the driverless end of that spectrum it will be genuinely disruptive for everyone in that space. Q. What are the implications then for product? Is there a mismatch between traditional insurance products and what customers want right now? A. Absolutely. It’s a little surprising to me that the insurance industry has gotten away for so long without genuinely transforming its products. If you look at a TV from 20 years ago and a TV today, they might have come from different worlds. I think that time has now come for insurance. The industry needs to move with consumer needs. There are risks today that didn’t exist just a few years ago. Cyber risk is becoming a mainstream area of concern for our customers, for example, but a lot of existing products simply don’t cover it. There are products out there that solve yesterday’s problems but are no longer fit for purpose. Q. Tell me about what you are doing in your three Digital Garages. A. When I got here the London Garage was already in place. The vision behind Garages is not for them to be incubators, or accelerators, or R&D labs for Aviva. They are probably best described as microcosms of some of the key digital initiatives at Aviva. We felt it was important to have this combination of activities in different stages of development. So, you have our UK digital business, which is based in the London Garage which has 15 million customers, sitting in the same room with a startup that has a handful of customers and is helping us with KYC processes. This is important because the lessons learned by both sides are quite interesting. The established guys look at the energy, passion, and focus of the startups and adopt some of that. And the guys in the early stage of their development look at the established business and can learn quite a lot about their customers’ problems and how they are dealt with. Our garages are innovation centers but they also help support some of our mainstream digital activities, and it’s working well for us. Q. So then almost everyone inside an Aviva Garage is an Aviva employee, is that correct? A. About 98%of the Garage population is made up of Aviva employees. We do have a handful of startups that we are partnering with that we will physically base within them. Q. You’ve just opened your third Garage in Toronto. How did you choose Toronto over any of the other cities you could have gone with? A. Toronto has an amazing innovation corridor, particularly when it comes to artificial intelligence. We felt that given the size of our Canadian business it was absolutely warranted. Q. Where’s the fourth Garage going to go? A. In the very short term, the three that we have are enough as they give us access to three different continents and markets. Before expanding, we first want to make sure that these three are working as a cohesive unit. Q. How many people work in these Garages today, and what’s the mix of skills? Is it the same in each Garage? A. The London Garage is the eldest one and the biggest of the three. Here, we have about 200 people, Singapore is about 120, and Toronto is about 85. Across all three, we’ll have representation from design, development, digital marketing, product development, and project management. These are supplemented with people who have what we would call manufacturing expertise – people from the mother ship who really understand insurance and who can work with their digital colleagues to create a great digital insurance experience. Q. Do the digital experts within the Garages come from within Aviva or are they all from the outside? A. The ratio is roughly 60/40 outside to inside. Q. Wouldn’t everyone at Aviva prefer to work within a Garage? A. One reason why we originally opened the first Garage was to create a sort of a shining beacon. If you talk to Mark, his vision is to demonstrate what Aviva could look like one day. Your point is spot on. People look at the Garages and say, “I want to work there.” We get a huge through-put of our colleagues who don’t even work in digital but who come here to have meetings, have a look around, and go back inspired. That’s precisely the purpose. Q. Are you able to attract the talent that you need? Incumbent carriers often struggle to attract top programming talent and innovative entrepreneurs generally prefer startups rather than insurance companies. A. We are competing with Google, Facebook, Snapchat, and so on. Aviva did a pretty smart thing by focusing first on recruiting the more senior staff in key positions and then used them to attract talent to their teams. It’s often forgotten that people don’t just work for companies, they work for people. The choice of a boss is as important as the choice of a company. Hiring leaders who had strong reputations in digital industry, and strong networks and personal brands was important to attracting people further down the ladder. That’s worked really well for us. Where we do struggle, quite candidly, is through the fact that we increasingly operate in a whole bunch of areas where we do require specialized skills, whether that’s in AI, or blockchain, or connected cars. I think this is a losing battle. No company in the world can attract tier-one people in every area. Where we don’t feel we have the right level of skills or the ability to attract the best, that’s where we will partner with startups we believe bring those skills to the table. Q. How do you find those startups? A. We have a number ways in which we engage with the startup ecosystem. Quite a few of us have come from that world, so our direct access to the startup universe is strong. But we felt the need to beef it up, so we’ve entered into a couple of accelerator partnerships, including with Founders Factory and Plug and Play. Those are the formal partnerships, but in addition we have several informal partnerships that give us access to their cohorts. We also work quite hard at expanding relationships with the broader ecosystem – VCs, universities – areas that widen the funnel. That’s working pretty well for us in terms of incoming ideas. Q. What kinds of interaction can startups that come inside and work within the Garages expect to have with Aviva? Can you offer them access to people (for advice) or to data, for example? Or to capital? A. We have three ways of interacting with startups – co-creation, partnership, or investment. If it’s a co-creation opportunity, then we will attack a particular problem jointly. The startup will bring its skills and potentially a piece of technology and we will provide access to data, to customers, to mentorship. In cases where the startup has a well-defined product, they may just need exposure to customers or to better pricing. Or we can just do a straight cash investment that’s more hands off. That still helps us keep our finger on the pulse and learn. Q. Is that through Aviva Ventures? How closely are you working with them? You mentioned that you sit right next to them. A. That’s right. We work very, very closely with them. As you can imagine, there is a lot of overlap between what we do. I tend to focus a little bit more on companies at the stage of seed and post-seed rounds. At Aviva Ventures, their interests are typically series A and Series B companies. So there is a difference in terms of sweet spot and focus, but the themes we are interested in are very much aligned. Q. What is the strategy for moving innovation out of the Digital Garages and into the main business lines? Is there a formal process? A. We did create a formal process. We have something called the Innovation Board that I report into that basically governs my activities and has a number of very senior people on it. Before we engage in any partnership or project, we will define the metric that project should hit to prove its value. If it doesn’t, then we say great idea but no thanks. If it does, then we’ve proved there is an early market demand and it goes through a process of integration with the mother ship. There’s then a formal handover and a new project owner is assigned. Q. When we spoke earlier, you mentioned that Aviva is working on an API. A. It’s not completely ready but it’s progressing nicely. We have a beta version of it and an internal sandbox. We make it available to selected partners. We are still debating the extent to which we make it publicly available for anyone to integrate with. Q. You referred to Toronto as kind of a hotbed of AI. What are you looking for from AI for the industry? What are your expectations? A. There are some obvious applications of it in underwriting, in fraud detection, in customer service, and possibly in claims. We think there are other areas where we can deploy it; driving efficiency is one. Q. How are you measuring the ROI of your innovation initiatives? A. That’s a million-dollar question. A. I’ve had multiple conversations with my counterparts at various companies in different industries and it’s a perennial question. The problem is in trying to put an ROI to something that is highly uncertain. Trying to put an ROI on a whole suite of activities with differing objectives, some of which are clearly financial and some of which are not at all, is extremely difficult. So we measure it on a project-by-project basis rather than on a holistic basis. Trying to apply a single metric or even a couple when there is such a variety of use cases, and such a variety of projects we can pursue, is counterproductive. It could incent the wrong behavior compared to generating the longer-term value we think exists. Q. I saw that Aviva is the first UK insurance carrier to develop a skill for Alexa. Was that out of your group? A. Yes. We think voice is a very interesting emerging UI that will generate increasing traction. It’s something we want to explore as a way of connecting with our customers. Q. What else would you like people to know about Aviva and your innovation efforts? A. We are very open and understanding of the needs of the startup world. We know that engaging with a startup involves more than just taking their technology and plugging it in, crossing our fingers, and hoping for the best. We have quite a comprehensive partnership protocol that involves using my team as an integration layer between the startup and the mother ship. Startups have been burned in the past by corporates saying they’re excited but then nothing ever happens. We avoid that at all costs. Q. How would you like startups to contact you? A. Either through our website or at digital.innovation@aviva.com. This entry was posted in Insurance and tagged AI, Aviva, Toronto by jim. Bookmark the permalink.